Pilkington originated in 1826 – founded with the technical knowledge and ability of John William Bell, and with the financial backing of three influential families in the St Helens area – the Brownilows, the Greenalls and the Pilkingtons. From that moment, the company continued to grow and became a private company in 1894, remaining so until 1970 when its shares were listed on the London Stock Exchange. Pilkington was de-listed from the London Stock Exchange in June 2006 when it was acquired by the NSG Group of Japan. The name Pilkington was retained as a brand for the Group’s building and automotive products. 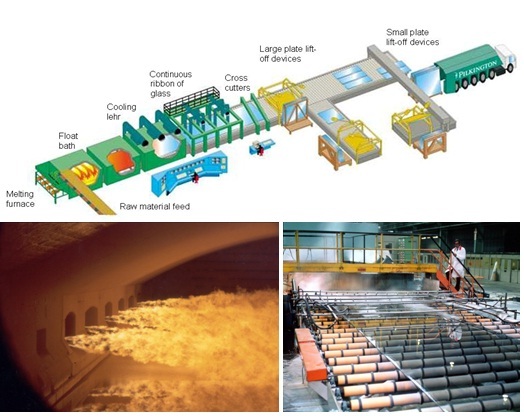 With the determination of Alastair Pilkington, the company was able to establish itself as an innovative glass manufacturer – with the creation of the first float glass process – a system that created a ribbon of glass by ‘floating’ melted raw materials at a high temperature over a bath of molten tin. This process, which took seven years to perfect and cost approximately £7 million (£80 million in today’s money!) – looked to surpass any existing glass production processes. The float glass process was announced by Pilkington in 1959, but was not put into use until 1967 – after which, it quickly became recognised as one of the major industrial inventions of the twentieth century, and a universal method for the manufacturing of high quality flat glass for buildings and transport. By combining innovative thinking with unrivalled expertise, the Pilkington brand has continued to develop a wide range of high quality glazing solutions, from high quality float glass to fire protection glass as well as a range of high performance glass coatings that can help to improve the energy efficiency of most properties. To read more information about The NSG Group’s history or to learn about the advantages of all our glazing solutions, please visit our official website.